This recipe is from the Lost Recipes of Malaysia cookbook. Recipes are contributed by chefs teaching at the At 19 Culinary Studio. This cookbook is available for sale at www.at19culinary.com and major bookstores in Malaysia and Singapore. Peel and cut the tapioca and sweet potato into big cubes. Boil them in a large pot for 20 minutes or until soft. Heat the oil in a pan and fry the anchovies until golden brown. Remove and set aside. 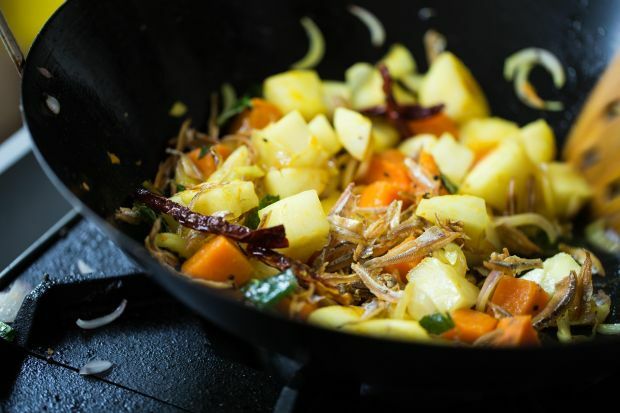 In the remaining oil, add the curry leaves, onions, dried chillies and mustard seeds and fry for 2 minutes. Next, add the boiled tapioca and sweet potato and stir-fry for 2 minutes. Add the salt, turmeric powder and fried anchovies and fry for another 10 minutes. Serve hot.